This fun block is easy to make and so fun when it comes together. It was created to be a part of The Festival of Half Square Triangles. The tutorial is well done and complete with well labeled images and easy-to-follow, step-by-step instructions. 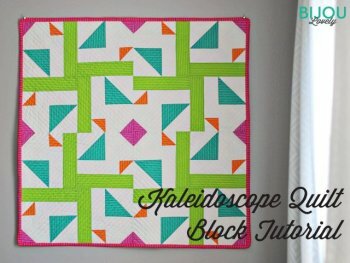 "I've got a block tutorial for you today that utilizes some half square triangles and a few rectangles to make a fun pattern that reminds me of looking through a kaleidoscope."